Update: Two of you had an even better idea to buy the tubs at Blockbuster that you can pop the popcorn in. They are even bigger and you could put cokes and the bigger movie size boxes of candy in them. I like that even better! I haven't been able to find the buckets I was wanting to use my vinyl on so I decided to go with plan B for teacher gifts. I will use my vinyl for a spring gift. I got these popcorn buckets in the dollar section at Target and I put a gift card to Blockbuster, popcorn, and candy inside. I think they turned out really cute, and it's something they will actually use and hopefully enjoy with their families. This is not my original idea. I think I saw this on a link from the Tip Junkie a while ago. Check out Cheryl's site for other great gift ideas. very cute idea. I am sure that they will like this. Those are very cute! I would have loved a gift like that when I was teaching school. Awww...this is a great idea! You are so sweet to do this for the teachers! I did something like this when Brady was in K5 and the teachers loved it, I think its a great idea!! That's a great idea! I bought some of those at Tar*get too, but hadn't figured out what to do with them yet! Thanks for the tip! I love this - I am doing it too and actually had it given to me when I taught! - and love the plastic container idea - I do it with the Orville big tubs for microwavable - add a couple of their favorite bottles of soda/tea/water and get the boxes of movie-sized candies - tie with cellophane and Christmas ribbon...I am so glad Blockbuster has such CUTE cards this season...I just love your site Jennifer - seriously - you rock! 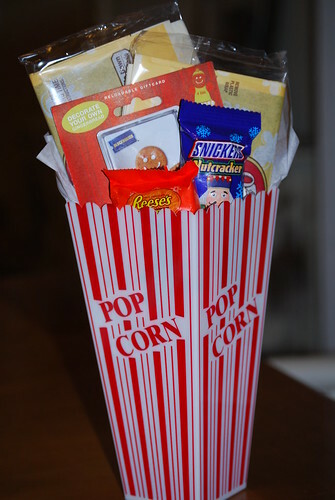 Another idea is to buy one of the popcorn tubs at blockbuster, and put the girt card with candy inside! Thanks for the link again! You are so sweet! That turned out sooo cute! I have my teacher gift ready to post (if I could just find a computer to post it from). My hubby let me hijack his work computer but only for a second. I am losing my mind without a computer! CUTE idea! I may do this next year! I did something similar for my sister & BIL 2 years ago and they loved it! This year I did monogram blanker (inexpensive because I can monogram it myself).